Here we'll discuss getting started in CAS, shooting techniques, weapons arsenal, ammo and reloading. Truthfully I'll be directing you to other sites that leave little for me to add. For a different perspective head over to our "About CAS" located on home page and read Purgatory Smith's writeup. It's worth the time to download and read his free book "Breaking the Shot, A CAS Shooters Practice Guide"
On his link to "Articles, Tips and Help", there is a whole section on shooting Technique. If you're interested in viewing various "Match" info and sample "Stage" setups and shooting sequence - he has over 80 samples for download. Well, this is a tough subject with many variants to consider. There are numerous sites/blogs with unlimited discussions, opinions and recommendations..... but it really reduces down to (1) Cost, (2) Traditional vs Modern and (3) Simple personal preference. When recently getting started in the world of guns-n-ammo for personal and home defense, I quickly realized the enormous complexity of gun options in both Pistol (SemiAuto) and Revolver (wheel-gun) along with multitude of ammo manufactures and sometimes limited availability of various calibers. Buying unique and special guns is great, but when you start shooting on a regular basis and a bullet cost .50 to $1 each – it kinda knocks the fun out of it. So for a combination of fun and personal defense, I opted for 9mm & 380 semi-autos and 38/357 revolvers. Realizing the expense of buying and shooting multiple types of guns & calibers, upon entering the world of CAS it was an easy decision to buy a caliber I already owned, the 357/38 over the more traditional 45LC and 44-40. But after growing deeper involved with CAS and expanding interested in different types of historical replica rifles and revolvers; I found many of the more unique variants are only available in the “traditional” calibers. So before forking out the cash, it is worth the time to review the offerings from manufacture websites: Ruger, Uberti, Cimarron, Taylors, USAF and Colt: Then select a caliber on the assumption your 1st cowboy arms rig probably won’t be your last…. 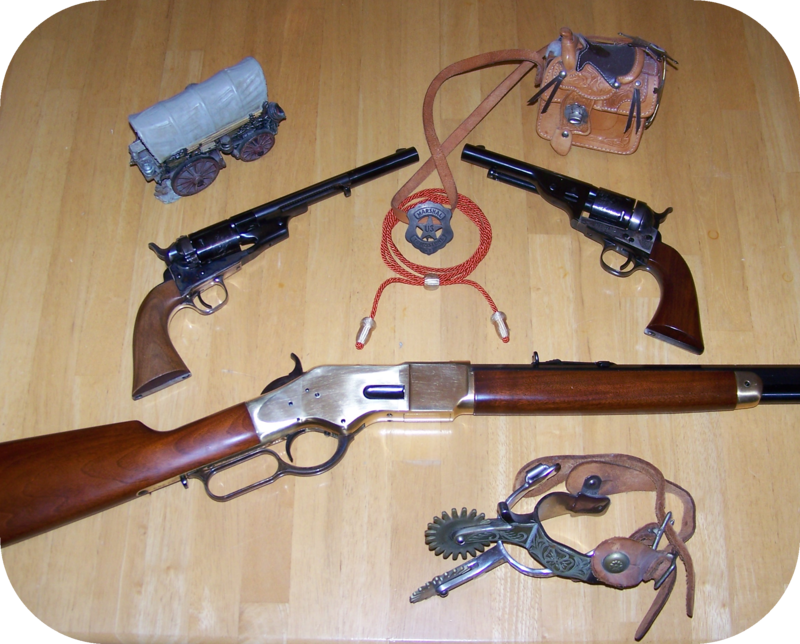 With the vast selection of late 1800s reproduction CAS rifles and pistols – it’s very easy to catch “gun fever” or “gun envy” resulting in future birthday and Christmas lists full of CAS items…..
Having limited funds and wanting jump-into CAS, I bought the Ruger Blackhawk 357 based simply on cost (under $400 new) and shared caliber with personal defense guns. The Blackhawk is not your traditional looking 1873 Colt Peacemaker – it’s similar to the later 1890s Flattop model. Even though the Blackhawk is non-traditional, it is still permitted in CAS. My beginner reasoning was low initial cost and the reputable Blackhawk “tank” design for literally a lifetime of service with shooting a minimum 1500 rounds per year. After installing Wolff springs and Super-Blackhawk hammer - shooting in SASS for two years now and these remain my default go-to smooth operators. Researching the modern reproductions, it’s interesting to note they are manufactured from original blueprints complete with original imperfections. Although the reproductions are identical with interchangeable parts – the main difference is in 1800s post manufacture assembly of the parts – manufactures cannot cut cost on material for obvious reasons, but cutting cost on fitting and smoothing parts is sacrificed. In late 1800s labor cost to smooth and fit parts prior to assembly was cheaper than improving the machinery – today is different. So just a suggestion that it’s worth the several hours to disassemble the reproductions and file or buff all internal parts, a simple set of jeweler files and a dremel tool will perform wonders on the action. This is based on my purchase of used 1860 & 1873 Open Top revolvers – love the look, but quickly found out they can be a bit finicky in operation. One locked-up on 1st use…. Disassembly showed a couple internal parts with very rough edges rubbing together to point of gouging and grinding until lockup. An evening of handy-work resulted in a whole new feel to the guns. Another issue I had was the trigger/hammer lockup – after cocking pistol, with a slight bump on hammer and it would release without pulling trigger. Took a while, but finally noticed that the trigger latch (internal part of trigger that rubs along hammer latches to lock in the various cocked positions) was not square – it was “manufactured at a slight angle resulting in a single point holding hammer cocked vs. a 1/4in square edge…. Again a simple filing to square resolved issue. I’m not saying all will have these issues or even most – just be aware of what’s out there and research history of brands vs. quality. Two of the Open Tops needed handy-work, the other 2 have been fine…. So, in the $500+ price range, there are several options for ruggedized CAS revolver variants such as the Ruger Vaquero, Vaquero SASS, new Uberti/Cimarron “El Patron” and Evil Roy. Even though there are plenty of options below $1000, for the hard-core fundamentalist, of course, there is the original Colt which currently starts around $1100. Also in the over $1000 range, another American Peacemaker manufacture is USAF. Additional note: Colts never seem to fall in value – the few used Colts I’ve found are not much below current retail….. If you attend several shootouts and do some CAS research, the most popular fast action rifle is the 1873. 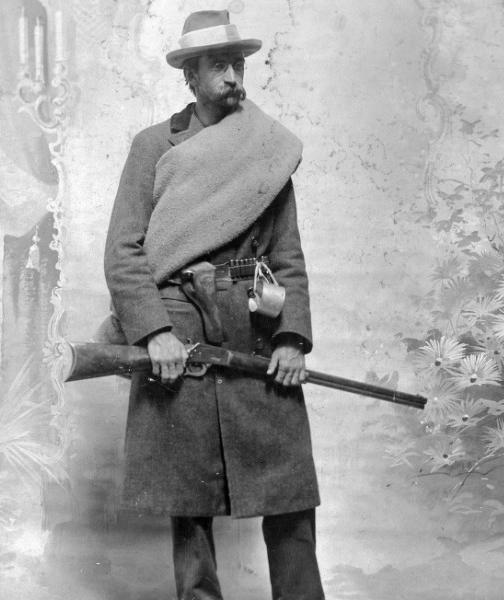 Other populars models are the Marlin Cowboy, Henry Big-Boy, 1866 YellowBoy, 1860 Henry and 1892. The Rossi 1892 is the typical starter rifle (was for me) as they can be found in any cowboy cartridge, relatively inexpensive and with a little action job - can be fairly smooth and very reliable. I bought the Action Job DVD from Steve’s Gunz (http://store.stevesgunz.com) It’s very good and shows that a little time with jeweler files and Dremel can work wonders on a “beginner” rifle. Kinda same philosophy as the revolvers – if you don’t have funding for a $1000+ action rifle, for around $500 and some personal time with your gun – plus a few key “action parts” - you can have a really nice shooter. I had typical 92 problems with mine and with the DVD plus several hours of tinkering – not one jam since. Due to the mechanically stronger design of the 92, not sure if it can match the fast- action of the 66 or 73 – but still, a very nice gun. I like the octagon barrels, so my 1st CAS Rifle was the 20in heavy barrel model – and since these are 357/38 – they can handle anything you desire outside of cowboy shooting specs…. After I became fully involved in CAS and searching for any remaining Navy Arms guns, I found an 1860 24” YellowBoy NIB for about same price as current Uberti/Cimarron offerings. WOW was that thing smooth right out of the box – just performed the typical new-gun cleaning and oiling…. Bring It out just for special occasions – use the Rossi/NavyArms 92 as my monthly shooter. So as with any type of shooting hobby – your options always start with budget restrictions - research your options from there. Lots of used options in Pawn shops, gun shows and on-line…. Be patient; get most bang for the buck - Happy Hunting. This is my area of least experience and one with the fewest options. Currently Cimarron-firearms have the complete selection of approved CAS options available on their website, so that is a place to start researching options…. As stated on the Stoeger website: The Stoeger Coach Gun was developed in response to the demand for a value-priced, short-barreled scattergun for use in Cowboy Action Shooting. The Stoeger was the 1st shotgun I bought for CAS – rugged, dependable and pretty straight forward on usage. With a little practice, it’s amazing how fast one can reload these things – plus its fun. Plenty of info out there on Coach Gun action jobs – just a few options of lighter spring and filing/smoothing a few spots creates a great CAS shooter. For traditionalist, the obvious choice is the “rabbit ears” hammer guns – these just look cool and are plain fun, but not for speed freaks. As you probably know the only approved pump shotgun is the 1897 “Winchester” and like the Coach, shooter is limited to two shot-shells and any time. It is truly amazing to watch the speed shooters in action with both the 1897 and Coach – it’s really hard to determine which is consistently faster…. So it really comes down to your cowboy theme of preference. At the regional events I’ve talked with Speeders that even file “feed-groves” into inside top of barrels as a guide for feeding shells into barrel…. Then there’s polishing and oiling the shell chamber for quick-flick extraction. Most of these shotguns are in the same price range between $350 and $600 depending on finish options. On the other hand, nothing beats hands on evaluation - so just come on down to an LVR Shootout (or any CAS event) and try out choices of your fellow shooters - everyone is always willing to let anyone give-em a whirl..... Just ask.